Half a block up from 28th, there is always a sandwich board, announcing specials. On the actual windows of the building with the El Nuevo Mariachi sign, there are pronouncements of good times to be had, including karaoke. I was drawn in and excited to finally see what was going on. Unfortunately, it was not to be. The place was empty but open during the noon hour and we sat down and tried to talk to the server…but the music was so loud that it was hard to function at all. We asked if it could be turned down, but to no avail. We were glad to be flexible and of course, optimistic that the hour would not pass without our palates being satisfied by some Latin treats. We headed over towards Marissa's Panaderia to see what we would find. We knew that there was grocery there along with the bakery. As luck would have it, there was also a little taqueria. It was called Marissa's deli and was just what you hope to find if you are searching for those unknown places that serve real Mexican food. 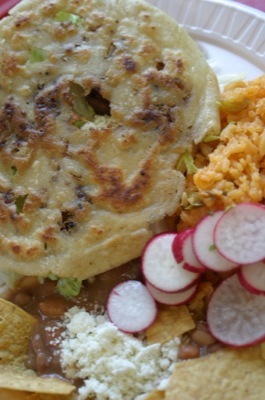 It had an offering rich in masa corn dishes, such as sopes, gorditas, huaraches and tlacoyo. It also had one of our favorite features present in many taquerias, namely those ubiquitous little handwritten signs that tell of secrets and specials. We were happy and hopeful for yet another great Latin eating experience. As per our agreement laid out in our intro article we were to order tacos and tamales. For the second or third time in a row, we struck out on the tamales. We were going to have to solve this problem soon. For tacos, we ordered our favorites: al pastor, lengua and carnitas (I also have heard that the cabeza tacos are excellent). 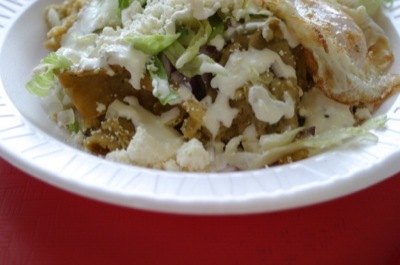 We also decided to order the chilaquiles, because it had been a while for this Latin tongue love of ours. Then it got a little strange. We asked about a sign that proclaimed the sale of an item called tostadas de pata de res, for $2.50. We knew that this had something to do with tostadas and beef, but pata was a new term for us. We inquired with the one and only worker at Marissa's deli and he looked confused and made a motion to his feet. Ok, so it seemed to be a tostada with cow's feet. Why not? Since we were on some kind of roll, most likely one of unknown eats, we decided not to fight it and ordered again with the guidance of a sheet of paper marked with a black sharpie. 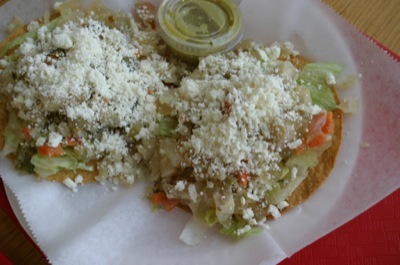 This one was stated that there was such a thing as a Gordita con Chales. Again, we were able to get from the worker that it had something to do with a pig. We were never able to discern the details and in fact, even the internet has been little help. All I can discern is that chales translates literally to shawl and that a couple translated Mexican food blogs seem to identify this meat as some sort of chicharron (pork skin). Funny, but we did really well. Spoiler alert: everything was really rather amazing. Often the taquerias we visit seem to be staffed by just one person who churns out a mass of food and they do amazingly well at getting everything ready quickly and well. Marissa's deli was no different. We grabbed our orders as they came up and dug in. 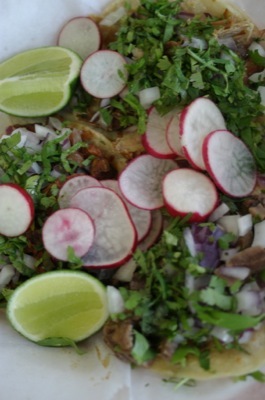 The tacos were all served on one big plate with the appropriate garnishes of radish, cilantro and onion. I started right in with the al pastor and was not disappointed. It was absolutely smothered in a nice bright red sauce that was surprisingly BBQ'y. The sauce imparted an excellent and rich flavor to the perfectly done and tender meat. The tongue was fine, but ordinary…a bit more meaty that average if anything. As we came to the carnitas, we could tell that it was the type of pulled pork that was fried before it was served on the taco. It was not at all dry, well seasoned and just a tad greasy. I loved it. The tostadas de pata de res had been sitting in the center of the table. I didn't know what to do with them. They had these gelatinous cubes where I thought there should be meat. Other than that, they looked ok, what with the generous topping of lettuce, pickled peppers and carrots, onions and queso fresco. But what were these things on there. I touched one of the aspic-like cubes…they were cold. Ok, these are the moments when I am really glad Charles is around. He picked one up and popped it thoughtfully into his mouth. Nothing much really happened. No looks of amazement or disgust. Cold, mild, refreshing and slightly savory was the initial report. I felt suddenly brave and took one for myself. It was mystifying this food. It was amazingly cool and refreshing and since it was a super hot summer day, this might have been the perfect dish. The pata was very slightly savory, but otherwise was more of an experience than a flavor. With the pickled items, the crispy lettuce, the creamy queso and the bite of the onions, it really was an well-conceived dish. As for the chilaquiles (pictured at top), they were something special. I couldn't quite define what made these different, but they certainly were. The mish mash of tortilla and salsa was quite yellow, as opposed to the typical green tints lent from a salsa verde or a pinkish hue from salsa roja. They were indeed made with salsa verde, but the overwhelming flavor here was masa corn. They were almost like melted down tamales, topped with an egg. And oh, what an egg. It was perfectly done and had the bright yellow yolk often associated with a farm hen, not the typical pale yolk from yet another factory hen. It is worth noting that the beans served with this dish were also quite excellent. Finally, we come to the Gordita de Chales. As stated above, all we knew about this was that it was some sort of pork. I do believe the chicharron reference is probably valid and upon doing further research, discovered that chicharron is a very common gordita filling. The meat was very crispy, salty and greasy. Yum. Combine that with the handmade corn masa cakes and this is one of those experiences that has you gobbling up more and more while it is still hot. It also makes me grateful to all the things that Latinos can do with corn, beans, meat, cheese and salsa. Do be aware though, that not all gorditas are created equal. Depending on where you are from in Mexico, they differ in size and style. The more notorious ones are almost like pita or pocket bread where the fried dough is "opened" and stuffed. Not all are deep fried either, although that seems to be the more traditional method. This one was comprised of two corn cakes, probably pan fried, with the filling in between, sandwich style. So, what would we go back for? Surprisingly the tostadas de pata de res. Also the al pastor, but I might try it next time on a sope. The handwritten specials have won our trust and admiration, so keep your eyes open for those. 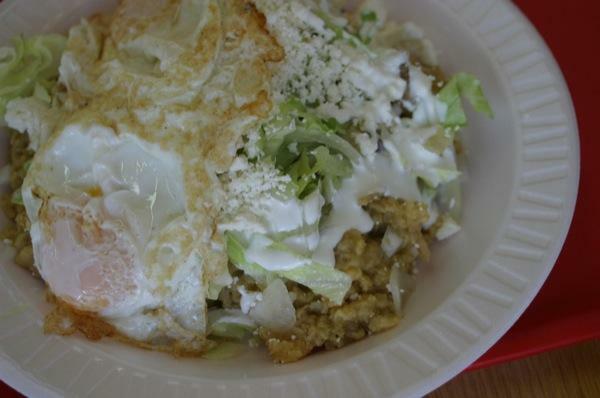 The chilaquiles have really stuck with us and since they serve other breakfast dishes, stop in sometime in the morning. Plus, right behind you when you are ordering is the panaderia, stocked full of tempting treats and hot coffee. Marissa's is really a one-stop. Enjoy! Hours: Not sure, will check back for those. Surprise: The surprise to us was that this place was even there. We were also really surprised with how many unique foods we were able to find on the menu. They obviously felt no need to cater to non-Latinos, making their menu more real. Language: Somewhat challenging, but fine. Lawrence Black is a writer and editor at Simple, Good and Tasty. He can be reached at lawrence@simplegoodandtasty.com. Despite the heat of summer, he continues to eat large quantities of spicy things...and without beer (a true daredevil). 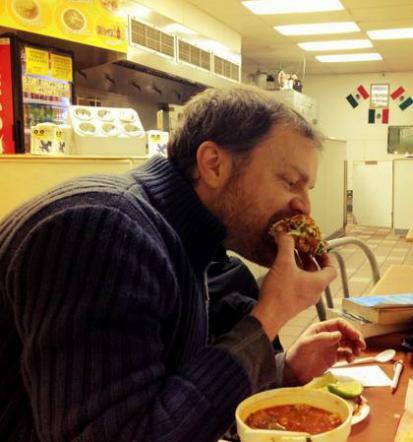 Our last Latin Tongue review was: Taqueria Hidalgo.